YANGON—The Myanmar government recently agreed to begin work on key projects under the China-Myanmar Economic Corridor (CMEC) agreement which is part of Chinese’s ambitious Belt and Road Initiative. 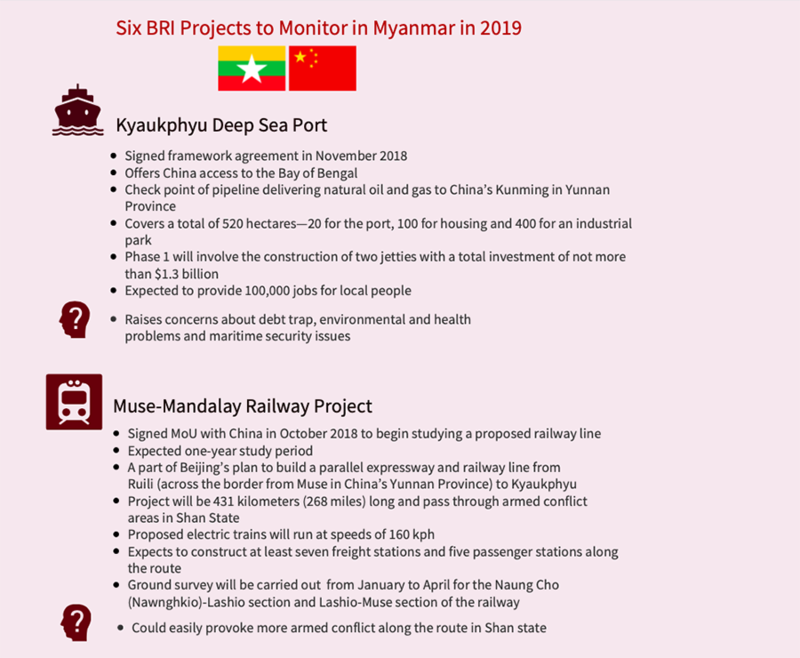 Experts, including voices from the World Bank, have pointed out that Myanmar’s growth will largely depend on major BRI infrastructure projects that get underway this year. The 1,700-kilometer-long CMEC will start in China’s Yunnan Province, go through Myanmar’s major economic cities—Mandalay in central Myanmar, the commercial capital of Yangon—and reach the coast at Kyaukphyu Special Economic Zone (SEZ) in Rakhine State. The proposal includes upgrades to three major roads through Mandalay and Muse on the Myanmar side of the border with China, and some other roads in Shan State. An estimated $2 billion will be spent in the initial stages of the project which is expected to be made up of 24 projects in total. 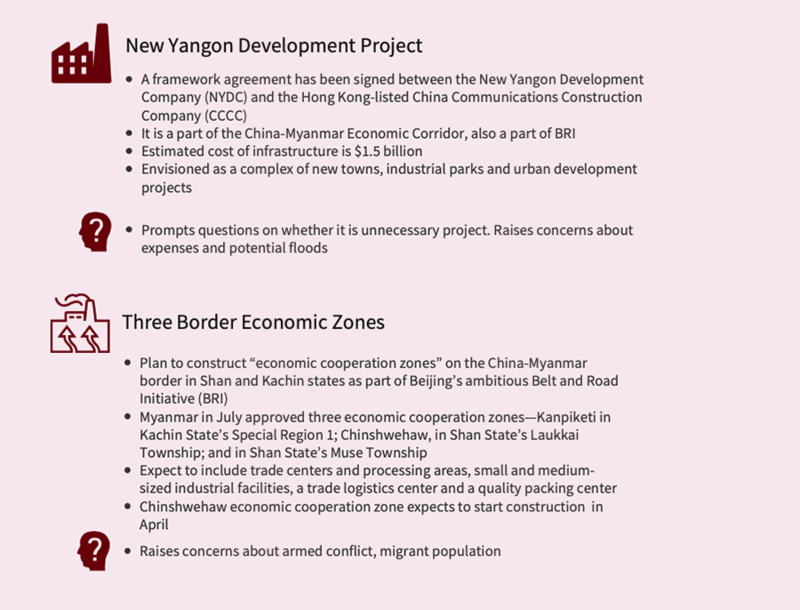 Among the 24 proposed CMEC projects, Myanmar has agreed to speed up the process of nine major projects, which include the Kyaukphyu SEZ in the west, the New Yangon City Development in Yangon and the border economic cooperation zones in Kachin and Shan states. 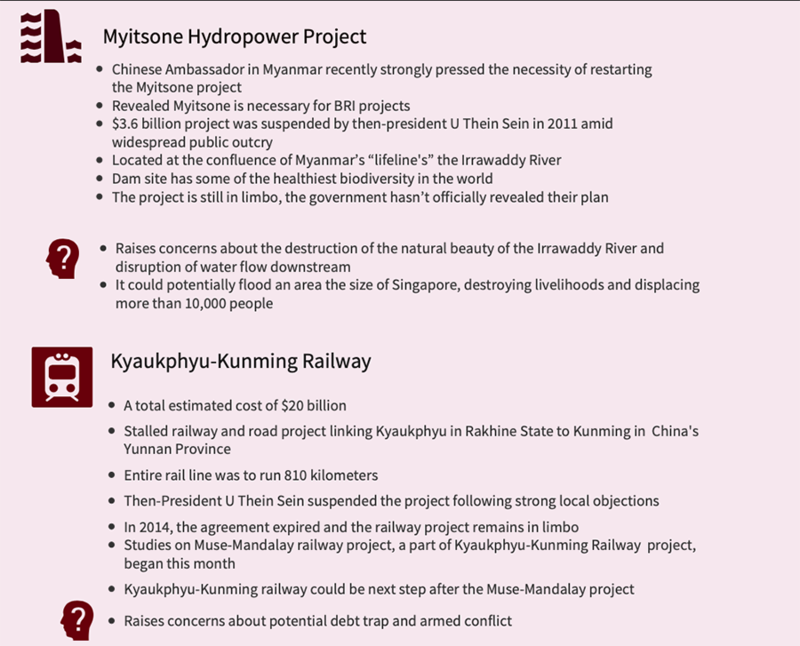 Here, The Irrawaddy looks at six projects which are set to be implemented this year and which require careful monitoring—including the controversial Myitsone dam project, on which a final decision could be made this year.